Tokyo is to Japan as New York City is to the US: modern, frenetic, a mélange of sub-cultures; in short, a blast! You can’t do it all, don’t even try, there’s just too much going on. But it’s great fun to explore and most corners are interesting. We covered aspects of the transportation system two posts ago: it is comprehensive and user-friendly, clean and safe. (If you missed it, here’s a link). Should you find yourself lost, no worries: it’s doubtful you could find yourself in an unsavory situation. Most Japanese will go out of their way to help point the way. Where should you go? There are no absolutes, with the exception (in my opinion) of Tsukiji, the famous fish market covered in our last post. A better question might be: What should you consider? As a starting point, I’ll mention some of our favorites. A perfect synthesis of contemporary architecture referencing traditional, exquisite garden and a few galleries focusing on exemplary examples of Asian art: the Nezu Museum in central Tokyo. The Nezu Museum is a great focal point for a day of exploration. This small gem of a museum anchors the eastern end of Omote-Sandō, a fantastic street for architectural aficionados. The architect, Kengo Kuma, was recently described in the New York Times as “the most famous Japanese architect Americans have never heard of”. The collection is exquisite, devoted to traditional Asian and Japanese arts. The real surprise is the lovely, completely concealed traditional garden. While there are innumerable museums, devoted to everything from contemporary art to manga, if you only make time for one museum, this is one I’d recommend. A fantastic street for contemporary architecture fans: Omote-Sandō. Omote-Sandō is the Rodeo Drive of Tokyo. It’s lined with designer boutiques from one end to the other. Even if shopping is not your focus, the work of a who’s who of contemporary architecture lining the street makes it worth a stroll. Mingeikan (Japan Folk Crafts Museum): The home of Soetsu Yanagi (1889-1961), philosopher and driving force behind the mingei movement, celebrating beautiful design and craftsmanship in ordinary, workaday objects. The Main Hall was designed by Yanagi and built in the 1930s to house objects exhibiting these characteristics. His house and garden also can be viewed on certain Wednesdays or Saturdays, so check the website when planning your visit (http://www.mingeikan.or.jp). In Yanaka, a section of Tokyo which survived the ravaging of WW II and preserves a feel of an older and more traditional Tokyo, is the house and studio turned museum of Japanese sculptor Fumio Asakura (1883-1964). The Asakura Museum of Sculpture was designed by the figurative sculptor in 1935 and shows subtle Art Deco elements in a beautiful traditional-style building. The interior water garden is accented by sculptural rocks imported from all over Japan. If you can only visit one temple: Sensō-Ji in Asakusa. Sensō-Ji Buddhist Temple in Tokyo can be thronged, but that can be part of the fun, adding a dynamic element to your shots. Tokyo’s oldest Buddhist temple is a pilgrimage site for Japanese, so this site can be thronged, but that’s part of the fun. I’ve been during festivals, during “normal” jampacked hours of visiting and very early, when only devoted dog owners are out in the pre-dawn with their pooches. Architecture, the garden, and people were all productive photographic subjects. Meiji is a Shinto shrine in a forest on the western edge of Omote-Sandō, making it easy to combine a visit here with a stroll down the Japanese elm (zelkova)-lined street of high-end designer shops and remarkable architecture. No trip to Tokyo is complete with experiencing the Shibuya Scramble! The world’s busiest intersection, Shibuya, is organized chaos, a synchronized mass crossing of waves of humanity. Especially at night, when the lights of the surrounding streets are lit, this is an amazing sight. Ginza-on weekend afternoons, the main street of Ginza (Chuo-Dori) is closed to car traffic, and pedestrians are out in force, enjoying hokoten or “pedestrian paradise”. Shopping in Japan: service with a smile on Ameyoko shopping street, easily accessed from the Ueno station. Merchants sharing a laugh in Ameyoko shopping street in Tokyo; we had a great time as well, wandering and street shooting. Shopping streets can be great fun and make for wonderful street shooting opportunities. On our most recent trip, we were introduced to the Ameyoko shopping street, 400+ stalls and stores strong, which stretches from the Ueno station to Okachimachi, under the Yamanote line train tracks. This area started as a black market area in the years after WW II. There are many eating options as well, with abundant tako-yaki stands (octopus balls). Tending to the tako-yaki (octopus balls) in Tokyo: If hunger strikes while street shooting in Tokyo, no worries…there are a reputed 80,000 (!) restaurants in Tokyo, many with only a bar counter and a handful of seats. Street food is readily available on shopping streets like Ameyoko. Pull up a chair for a quick bite of tako-yaki (octopus balls) as signified by the red banners in Ameyoko shopping street. A few words on the camera gear I used: As always, I used my Fujifilm X-T2, coupled with the fast and very versatile Fuji 16-55 mm lens. For temples and museums, I made abundant use of the wide-angle end of the range; the fast f2.8 aperture came in handy when shooting in the pre-dawn and early evening hours. 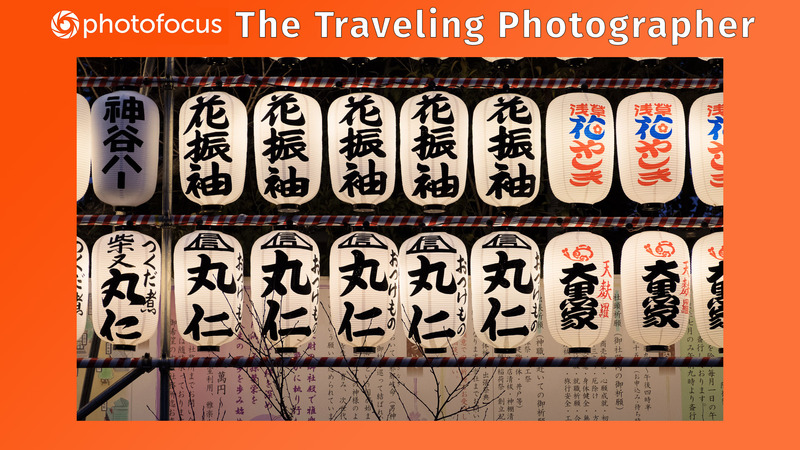 That’s a quick overview of some of the MANY possibilities for shooting in Tokyo. In my last post, I wrote about my ichi-ban (#1) recommendation for visitors and traveling photographers in Tokyo: the historic Tsukiji fish market. Tsukiji is slated to be moved out of central Tokyo this fall, so don’t miss it if you are in Tokyo this year. The sites profiled here don’t have a time-limit on them, thankfully! Tokyo is a sprawling metropolis which I could happily spend weeks exploring-with these suggestions as a starting point. Here’s wishing all splendid discoveries of your own along the way.